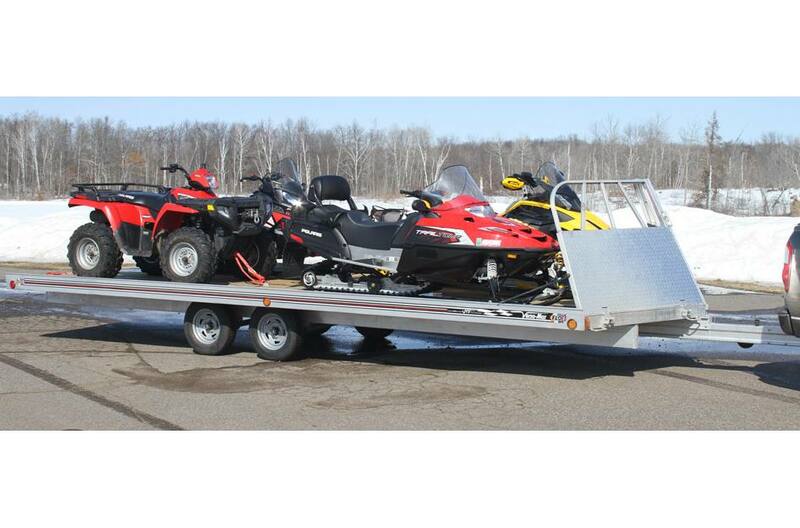 Floe 4 place snowmobile trailer with salt shield/ramp and electric brakes. Available in 10′, 12′, 14′, 16′, 22′ and 28’ lengths. Stowing ramps on a VersaMax trailer. The 52” extra-wide ramp is constructed out of 3/8” pressure treated plywood that’s framed with aluminum to provide maximum strength, durability and safety. The raised aluminum edges keep both wheeled and tracked vehicles centered. When it’s time to hit the road, the ramp is smartly stowed under the trailer with a Slide-N-Glide system. A built-in ramp handle makes for easy handling and a speed crank secures the ramp tightly and prevents rattling. Lowering front ramp on VersMax™ trailer. The FLOE Ramp/Salt Shield makes it the easiest drive-on/drive off trailer available. The longer tongue on a Versa-Max™ Ramp trailer allows enough space between your trailer and the tow vehicle to lower both sides of the ramp/shield combo at the same time without jackknifing the trailer. Crank for tightening stowed ramps. After stowing your trailer ramps, the crank holds everything tight to eliminate rattling. Ramp clips for VersaMax trailer. Built-in safety hooks keep the ramp secure while loading and unloading. Ramp hooks located on front and back of trailer for convenience of driving-on/driving-off your cargo. Versa-Max™ Ramp Trailers – The ultimate in reliable performance and quality. Whether you want to haul one sled, six sleds or any type of load, there is a Versa-Max™ ramp trailer for you. Extra wide 52" ramp is easily accessed with the self-stowing Slide-n-Guide system. The heavy-duty ramp easily attaches on the V-front of the trailer for unloading and on the rear of the trailer for loading. Works great for both wheeled and track vehicles. Optional Enclosure Weight: 570 lb. A minimum of 2-1/2" must be kept between the tire and the trailer frame. If larger wheels/tires are used (beyond FLOE's standard upgrade), spacer blocks may be needed. Minimum tongue weight is required to reach rated cargo loads listed. Minimum tongue weight is the empty trailer. Loaded tongue weight should never be less than the empty trailer tongue weight. Optional Enclosure: The "cargo load" of your trailer will be reduced by the weight of the enclosure.